Lately I’ve been devouring a book of essays by Haruki Murakami called, What I Talk About When I Talk About Running. Reading these essays is like munching on fine, dark chocolate. 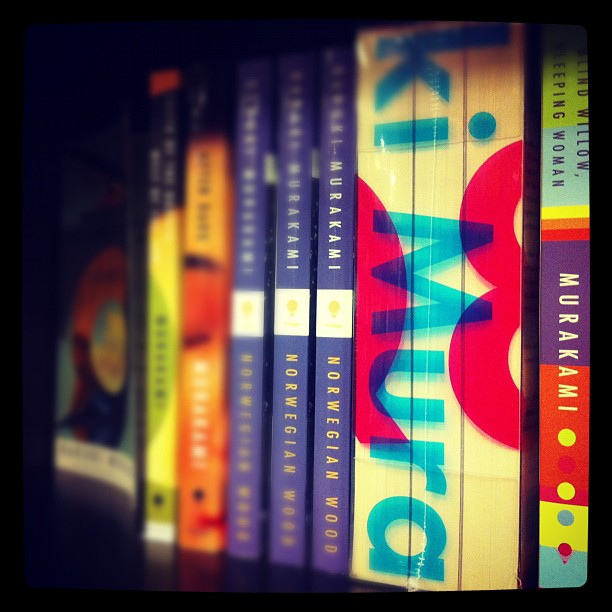 Murakami writes with appreciation for my two favorite pursuits: running and writing. There’s a particular passage that gave me insight, and after reading it, I found a word for something that has been missing from my writing practice. I have lived with this feeling for a long time but hardly knew it by anything other than exhaustion and lack of time. Like many others, I work for a living and write on the side. Writing my novel is one of the most important things to me, but some days it ranks #40 on my list of things to do. And after a long day when the other 39 things have drained my resources, I have little left to write a compelling, complex, and thoughtful story. In the passage above, Murakami alludes to focus, a place of deep concentration in which we can direct our energy to a single activity. After a long night of working, Murakami found that he could only get so far with a novel. He couldn’t go as deeply as he wanted to. So Murakami did what so few of us writers are able to do: he left his job to become a full-time novelist. After creating a decent name for himself and gaining some traction, he made the risky decision to sell his business. His friends tried to talk him out of it. They told him to take two years off and let someone else run the club, but Murakami knew that this was the right path to take, even if it meant failure. If he weren’t 100% serious about writing, then he would never take writing seriously. Being a writer means “a writer and something else.” We are writers with day jobs and something else. Something else is anywhere from teacher to lawyer to computer tech to corporate flunky. We live as writers, but few can make a living writing. When I was reading this essay, I had the rare opportunity to spend a day as a full time novelist. Having recently joined Willamette Writers, I had access to their house outside of Portland, where members can rent a room for the day and write. The two days I spent in this space was a luxury, and I’ll admit that I lamented that I didn’t have the lifestyle, where I can spend eight hours every day writing a novel. But I soon realized how deluded this was. I didn’t need uninterrupted chunks of time to write a quality book. No matter how much or how little time I have, I can still make the best use of it by keeping a few things in mind. My only job is to show up and write. I don’t have to do anything else but work on my novel, not answer e-mails or catch up on blog reading. When I sit down and pull up the manuscript, the novel is my only job in that moment. Working on it is as important as the other 39 things on my list; cleaning the kitchen; going for a run; or grocery shopping. Sometimes we have to write even when we’re not feeling energized or inspired. We just have to do it. At the Willamette Writer’s house, there were moments when I was tired. My impulse was to nap on the couch. But I didn’t feed this impulse right away and I was able to work through it. I wanted to ease up and pull back my efforts. But I kept writing, drank some chai, and soon forgot about it. Writing time is a gift. The time we do get is hard to come by, and this last year has shown me how valuable this time is. With a little awareness (and an app that blocks diverting websites such as Facebook), I’ve become less distracted by e-mail and the Internet while I write, but that takes mindfulness. I can write like a full time writer without living like one. Now when I work on my book and I’m not at the Willamette Writer’s house, I remember how great it felt to devote that kind of time to my book. I call that feeling to mind, even if I only have a half an hour to write. Do a little bit each day. The more time I spend away from my book, the easier it fades in my mind. I forget how good it feels to work on it and how much it means to me. And the fresh ideas dry up. Working on it a little bit each day keeps it alive. I suspect the reason NaNoWriMo works for so many writers is for the same reasons you were productive at the Willamette Writer’s House–no matter the endeavor, we all perform at a higher level when we are focused. While many (most?) writers don’t have the luxury of being full-time writers, we can all act “as if” and stay focused on what matters. I especially like your last suggestion–do a little bit every day. I find that works for housework, gardening, exercise–you name it–because there is such a satisfaction in simply moving forward. Thanks for sharing this–great food for thought! My perspective changed in a big way after reading these passages. I began to think of it not in terms of making time or having the motivation but in having the focus. Thanks for your comment! I agree. Focus is the key. I also like the idea of taking off for a couple of days every so often with nothing else to do but write. Kind of recharging the batteries, so to speak. I think my biggest problem right now is the constant stream of distractions, e.g., I’m reading your blog and replying 🙂 I think I need to start using my app to make the internet inaccessible for a certain amount of time. I think my productivity would soar.